Understandable, brave, even perversely admirable were desperate Japanese kamikaze attacks in the year 1945, made in time of war in final defense of homeland against an armed enemy. Not comprehensible is the blind and vicious hatred behind the September 11 attacks in the year 2001 made in a peaceful country against innocent men, women and children. There is no parallel. I first saw his airplane a mile or so away as it wove through anti-aircraft fire over the Ie Shima airstrip, then watched as his flight ended in an explosive ball of flame, less than 200 yards from where LCT 746 lay at anchor. I never saw the pilot's face but half a century later he lingers in my mind. I imagine him as young, a student dressed in immaculate white, a sash and oriental shirt with flowing sleeves, his face smooth and serene, the tan of his skin contrasting with the white of his clothing. I try to comprehend his thoughts and actions. A final goodbye to a few friends and perhaps a damp-eyed instructor and mentor, reluctantly parting from one of his prized students. No family present, they will be told of his heroic death later. And finally, before the final takeoff in his small and fragile plane, brief but solemn ceremonies as he pledges his mortal being to emperor and homeland. He probably started from Kyūshū, southernmost of Japan's home islands. The last face he sees is that of his mechanic, somber as he pulls the propeller to manually start the small engine. Then he taxies to the end of the runway, revs the engine. It sounds strong and eager, ready to take to the sky. He pushes the throttle ahead for takeoff, gathers speed . . . and feels the little airplane free itself from the soil of his homeland for the last time. He is now a kamikaze. He will strike one final blow, giving his life in defense of home and country. The flight is smooth in perfect weather. He flies low over the water to remain nearly invisible to the radar and eyes of enemy picket ships between him and his target. Because the flight will nearly exhaust precious fuel, he throttles back to 70 knots, the most efficient cruising speed. His airplane has been stripped of any items of value, even the radio. He'll be in the air for about four hours, lonely hours filled with thoughts of home, family, and friends; the girl he'll never marry and children he'll never have. No need for fancy navigation equipment. He has studied the charts. His target lies among hundreds of enemy ships, massed at anchor just past the small island of Ie Shima off of the west coast of Okinawa. He simply keeps the string of the sparsely populated but beautiful semi-tropical islands off to his left. These stretch south of Japan, all the way to Okinawa, and will guide him to that target and triumphant final sacrifice. He spots a few small boats, fishermen probably, and once, on the horizon, the ominous bulk of a destroyer, one of the picket ships guarding the enemy anchorage. But his small plane goes undetected until, to his left, he sees the larger land mass of Okinawa and, directly ahead, Ie Shima. He pulls up to the 500 foot elevation of the Ie Shima airstrip, skimming a scant 50 feet above the ground. A glance at the fuel gauge shows a few gallons left. Good! Enough to start a hot and destructive fire. And luck is with him. So far he has either gone unnoticed or been mistaken for one of the many small aircraft used by the U.S. Army for artillery spotting and medical evacuation. But once over the airstrip, he begins to draw gunfire. He opens the throttle for more speed, weaving to present a difficult target, giving gunners little time to aim. Untouched, he reaches the southern end of the airstrip and sees before him the enemy armada, a plenitude of targets waiting at anchor. But there's no more time. Now dozens of gunners on those ships have him in sight. The sky is suddenly full of streaking steel and glowing tracers. Shell bursts buffet his fragile plane. Anti-aircraft fire will soon find him. He reacts quickly, inverting his airplane in a smooth half-roll. And there, almost directly below, he sees the 340-foot-long hull of an enemy landing ship, less than a hundred yards off the beach. He pulls the stick back, sending his plane in a precise vertical dive, crashing dead center into the ship below. The engine of his plane becomes a projectile, cutting through three steel decks and into the ship's engine room. Ruptured tanks spray fuel, sending sheets of flame across decks and down passageways, incinerating all in their path. A perfectly flown kamikaze strike. I watched as the pilot died . . . instantly and in vain. I hope that he was distracted by gunfire and concentrating on precision flying . . . and never noticed the deserted decks, unmanned guns and empty bridge of his target. It was LST 808, wrecked and abandoned, gutted by a torpedo attack a couple of days earlier, but with decks and superstructure intact, still resting upright on the coral sand in the shallows of our anchorage. LST 808's damage report states: "During an air raid on 20 May 1945, while the ship was resting on the reef at Ie Shima, a Japanese plane dove into the forward part of the superstructure at 1837 and penetrated through the boat deck, main deck, and into the wreckage on the tank deck" . 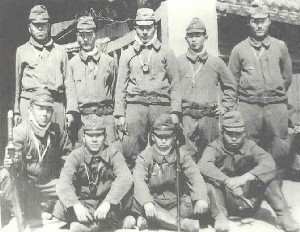 Japanese records of kamikaze pilot deaths indicate that only one special attack squadron, the 50th Shinbu Squadron, made a sortie from Kyūshū on May 20, 1945 . Ten Army Hayabusa Type 1 Fighters (Allied code name of Oscar) took off from Chiran Air Base at 1605 to 1613 . A Hayabusa Fighter normally took just a little more than two hours to go from Chiran to Ie Shima , so the plane that hit LST 808 at 1837 almost certainly was a Hayabusa fighter from the 50th Shinbu Squadron. Moreover, the dates and times mentioned in the last writings of two 50th Shinbu Squadron members (Last Letters of Second Lieutenant Ryōsuke Ogiso to His Parents and Last Writing of Second Lieutenant Masayuki Tatara) are consistent with when LST 808 was hit. The LST 808 war diary, recorded by Captain Stevens, and the official damage report describe what happened to the ship on May 18, 1945 . At 2206, a large Japanese twin-engine plane passed over the stern just above the mast, and a torpedo hit the ship with a terrific explosion about 30 seconds later. Small fires were quickly extinguished, but the explosion killed five men and wounded five others of the LST 808 crew. Another five men aboard from the boat pool died in the explosion, and one wounded man from the boat pool died the next day. With LST 808's main and auxiliary engine rooms wrecked and flooded, two tugs towed the ship to shallow water where she rested on a reef. Most of the crew went ashore at 0300 on May 19. LST 808 had a security watch of only five men on board when the kamikaze plane hit the ship on May 20. Oberg, Tanney Edward. 2005. Lucky Sweetbrier. New York: iUniverse. Sakurai, Takashi. 2007. Dai 50 shinbu tai. (50th Shinbu Squadron). <http://www5b.biglobe.ne.jp/~s244f/shinbutai_hensei-025.htm> (July 25, 2007).